*No matter the project size. We don't want to brag, but our founders (Germán and Juan Pablo) won the first Peruvian Wayra Week, with the project Worldrat. And this project also made it to StartUp Chile. These guys really rock! But we don't want to brag, eh! We have so much fun designing and developing our products that, sometimes, we can't call it work. A Color Picker Chrome App, with Chroma you can access all the shades of a color, know the HEX, RGB, and RGBa of an specific shade, copy it and use it wherever you want. One of the first Online Collaborative Slide Editors, launched in 2007 and showcased in several publications. We started licensing Prezentit last year, being Skoletube, a danish education organization, the first of these licenses. With Clay you can forget about making changes to dozens of HTML files just because you need to add a link in the header. And it acts like a real server! We make sure that every aspect of the project runs smoothly, from UX analysis and UI design to Front and BackEnd. Each client is unique, like the products we develop for them. One of the most visited news sites in Latin America, Infobae hired us to redesign, implement web standards and responsive web design. We redesigned Condor Travel with the goal of boosting tour inquiries. We also developed a fully customized content management system. We redesigned MiraTV.pe having in mind that the Miraflores Municipality wanted it to be 100% responsive and that it had to be accesible for older citizens. The Ministry of Justice from Perú needed a site to promote the "Human Rights National Plan". They asked for a fully responsive and accesible site. 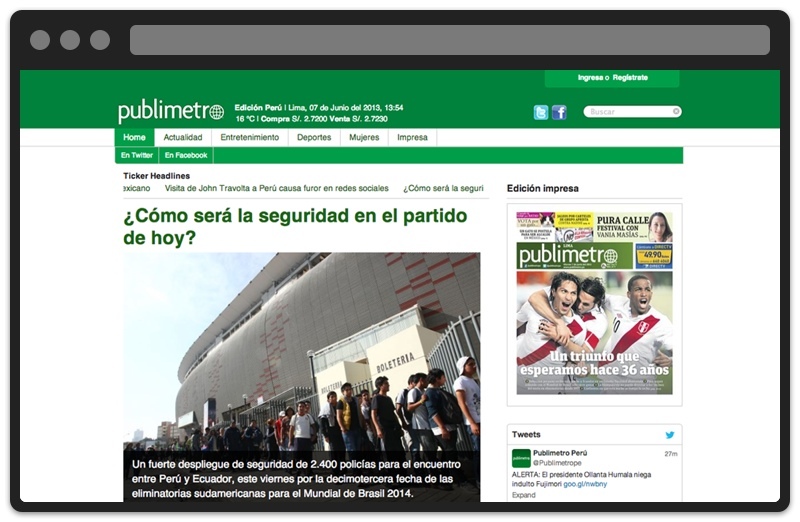 When Publimetro launched in Perú, it needed a fast, clean and accesible design. We had it ready in less than 2 weeks, and it was the first HTML5 news site in Peru. We have provided solutions to companies and individuals of all shapes and sizes. We take time to really understand the requirements of our customers and develop our strategies in line with their individual needs. Let's build great things together. If you need information, want a quote, or want to be part of our team, send us a few lines.